Sometimes things are such a happy coincidence that it reminds us how strange and wonderful the universe is. Yesterday, after dropping off two packages at the post office, I decided to swing by Barnes and Noble, which is located very close to the post office. I perused their tarot deck selection, which was quite good, but other than the Cat Tarot, nothing quite drew my eye. I ultimately exercised a great deal of self-control in not getting the Cat Tarot because I realize I am not really into cutesy decks and would’ve used it for a week before shelving it and eventually giving it away. I decided to look at what other bookstores were in nearby towns that I had not been to. I found one in a nearby downtown and spent some time happily looking through their vintage books but ultimately found nothing to take home with me. I looked on Google maps to see if there were any other bookstores in this town and found one just a few miles away. I made my way there and parked along a street about a quarter mile away. As I was walking towards this second bookshop, I came across a shop bursting with vintage items, and I got excited. I’m still on the lookout for card catalogs and printer drawers, so I thought I would take a look inside. There were little treasures and knickknacks of all kinds spilling from every direction. I was in heaven. I’ve been really into vintage and antique paper items, like old postcards, letters, and photographs, so I was keeping my eye out for these things when I happened upon three decks that looked suspiciously like tarot. I went over and saw that one was an oracle deck, and two were tarot. The first tarot deck was a used copy of the Hanson-Roberts listed for $10. The second deck appeared to be a battered copy of a deck I had never seen before: the Ancient Enlightened Tarot. It had no price tag. At this time, the owner of the shop appeared from somewhere in the very back of the store and welcomed me. She informed me that the card machine was down, and she was taking cash only and that there wereATMs nearby. I asked if the deck was $10. She looked at it for a moment and said, “I’ll give it to you for $8 since it’s in such poor condition.” I opened the battered tuck box and found that the cards were actually in excellent condition, and in fact, were almost all in order, as if no one had ever used them and maybe had only looked through them once. Since the cards were in order, I quickly flipped through and saw that they were all there. I took out my wallet to see how much money I had and saw that I had exactly $9. Perfect amount. I thought, why not? I’ve never happened upon a tarot deck for less, it looked old and interesting, and I had exercised so much self-control at Barnes, and I had the exact amount in cash. The universe was telling me to get it. I bought it, went home, and Googled it and discovered that the deck is a historic reproduction of the Sola Busca, the first known tarot deck to have illustrated pips, and to find that it is OOP! 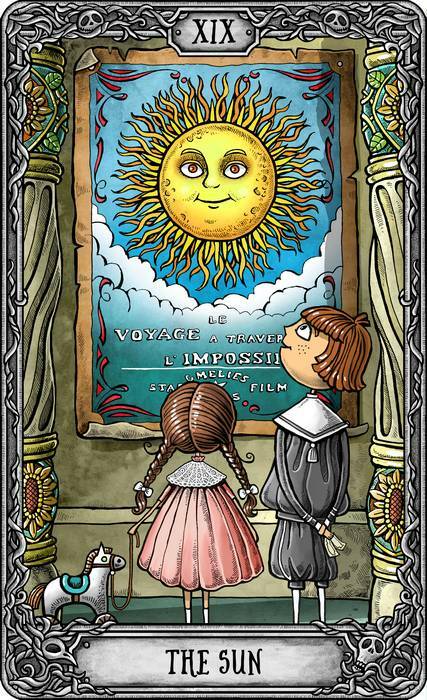 Also, apprently, an hour before I posted about my find on Instagram, Lo Scarabeo had just announced a new edition that they were releasing of Sola Busca (probably at the very time I was purchasing the deck!). I had known nothing about historic reproductions, other than that such decks existed, so didn’t realize at the time of purchase what a find this was. I was, and am, strangely drawn to it, although it is not my typical style of deck. It feels like a comforting deck in a way because there are no truly jarring images, and it just feels old, gentle, and wise. I’ve decided to do a review of my collection each quarter, so here are my 2019 Quarter 1 reflections! I began 2019 with 19 tarot decks. I acquired eight decks: three in January, two in February, one in March, and two in April. I currently have 18 decks: 7 mass-market decks, 8 indie decks, and 3 OOP decks. None of the decks acquired August 2018 through December 2018 were let go! 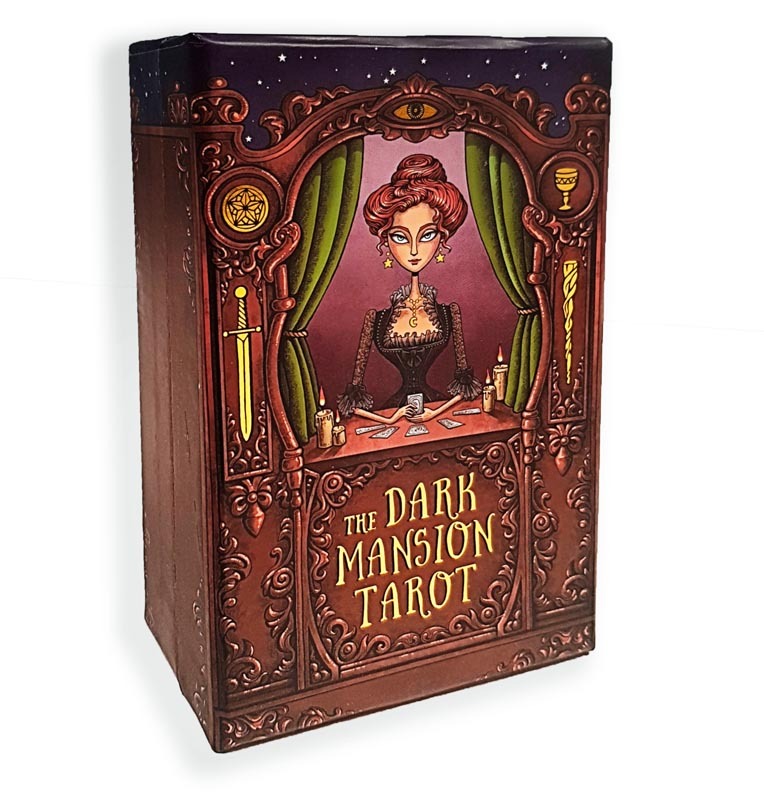 I obviously was not expecting The Dark Mansion Tarot to arrive as quickly as it did, but I am sure glad it did! Literally two days after I wrote my post, “The Waiting Game,” my bf, upon arriving home from work, said there was a delivery attempt notification from the USPS saying I had a package waiting for me at the post office. Hmm, I thought, almost everything I order is from Amazon and occasionally from Etsy, and none of these typically require signature or delivery confirmation. I got home and looked at the slip. The package was from a Krzysztof Wasiuk. Omg, I’m pretty sure that’s Polish. Definitely from Poland! “It has to be it,” I thought, “I don’t know anyone else from Poland!” Instagrammers quickly confirmed it. TIP: Pay for the expedited shipping at 5 extra dollars; it’ll be the difference between waiting two weeks vs. waiting two months as is the case for most folks! I ordered the deck on March 17th, it was shipped out on March 19th, and it arrived at my local post office on April 1st. But OMG, what a STUNNER!! The cardstock is silky matte and feels amazing to the touch, like satin, but are not flexible or slippery, so the cards are not as easy to riffle shuffle as you would think. I guess that’s because the cards are completely matte with no gloss. But that’s okay because the cards are JUST SO beautiful. I am fiery and resilient, and I stand my ground! I will get my point across to you no matter what. I am patient, diligent, and hardworking. I am not as compassionate or gentle as most people would like, but I will get you to listen, and that’s more important! To go forth with your vision; to not give up, and be persistent; and to lead with your passion, and be successful. You should recognize and acknowledge what you already have, but not hold on to your perspective so tightly that you can’t look at things in a different way. Full of life, and full of success! What a beautiful and fiery deck! I’m SO excited to be working with it. I am NOT good at the waiting game, which is when you have ordered decks not from Amazon but are accustomed to shipping times a la Amazon (same-day or next-day, but at most, two days), such as internationally or through Etsy or Kickstarter, and god forbid, there is no specific timeline or there is no tracking, and all you can do is WAIT everyday and check your mailbox diligently. 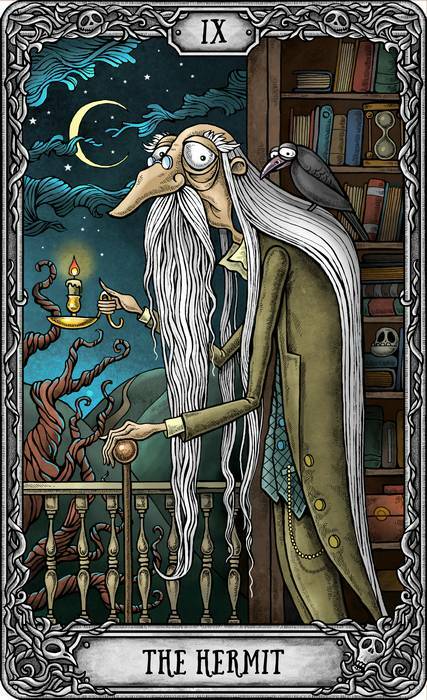 I am currently playing the waiting game with two decks I recently ordered: The Slow Tarot and the Dark Mansion Tarot. The Slow Tarot is a deck I came across on Kickstarter, and it is STUNNING. Each card image is an original oil painting by the incredibly talented Lacey Bryant. The campaign is organized by Modern Eden gallery in conjunction with Lacey. Modern Eden is located in San Francisco, so I will definitely be checking out the original paintings when the exhibit opens in late April. I am not generally drawn to contemporary decks, but the art here is just so incredibly beautiful, how could you not be drawn to it? 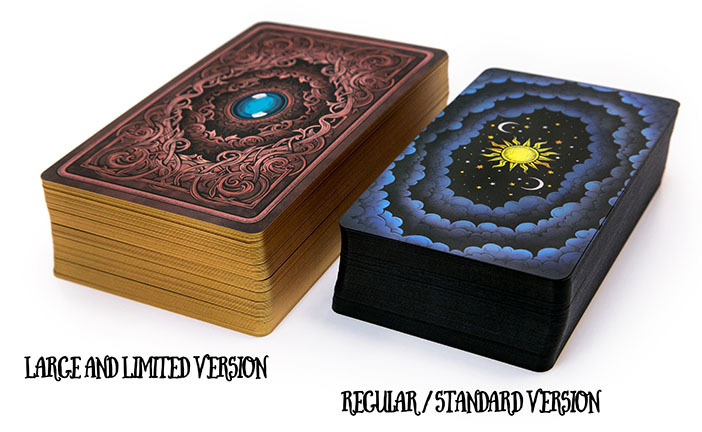 The art is already finished, and the regular updates indicate that the deck will likely ship out in April, so I’m eagerly anticipating its arrival in the next month. The Dark Mansion Tarot by Taroteca Studio first made its appearances in my Instagram feed late last year, and I was entranced. I kept putting off ordering it because it came from Poland, and I don’t generally purchase internationally unless through Ebay, and rarely even at that. This is the only deck, however, where FOMO has ever hit me, and boy did it hit me hard, so when I finished doing my taxes a few weeks ago, this is the first thing I ordered. And I love this Hermit card! Based on what I have been reading about and hearing on social media, this deck takes a while to make its way to you in the states, so it looks like I’m in for a long wait, although it will be WORTH IT! I’ve always been a proponent of spending money allocated for tarot on decks, rather than accessories, such as pouches, cloths, etc. (crystals don’t count! ), but recently, I have been enamored with tarot bags on Etsy. I’ve been eyeing a few, and I fell in love with the patterns and prints offered by thebeeandthesnake. The bags are lined and are reasonably priced at $12 a pop for small bags. A lot of other bags I had been eyeing have been $20+. Because I loved the prints so much and because Betsy, owner of thebeeandthesnake does refund overages for shipping, I went and purchased FOUR of her lovely pouches. I generally only house tarot decks in bags if they come in large or unwieldy boxes — namely, Llewellyn decks. All other decks are housed in their original boxes. The decks in pouches previously lived in primarily nondescript velour or velvet bags. I thought they deserved something a little more beautiful and something that reflected their personalities. I got a pouch each specially to match Shadowscapes, the Mermaid Tarot, the Everyday Witch Tarot, and Tarot in Wonderland. I’m so in love with these that now my two remaining decks in pouches (Zombie Tarot and Dreaming Way Tarot) now need to be properly clothed in some of these bags! I will definitely be purchasing again! I’m giving away a used copy of the Ostara Tarot here and the Sasuraibito tarot/altar cloth here. As with all of my previous giveaways, I’m going to let the Ostara tarot deck decide where it wants to go and ask the Moon Void Tarot where the tarot cloth wants to go. I’ll be shuffling and drawing one card on SUNDAY, March 24th at 5:00 PM Pacific Daylight Time for the Ostara Tarot and at 7:00 PM Pacific Daylight Time for the tarot cloth. I’ll keep drawing one card until there is a winner, and I’ll take a picture of the card and post and DM the winner on Instagram. I’m only accepting entries on Instagram, so if you’re interested, head on over there. Giveaway is for US residents only since shipping internationally is prohibitively expensive. 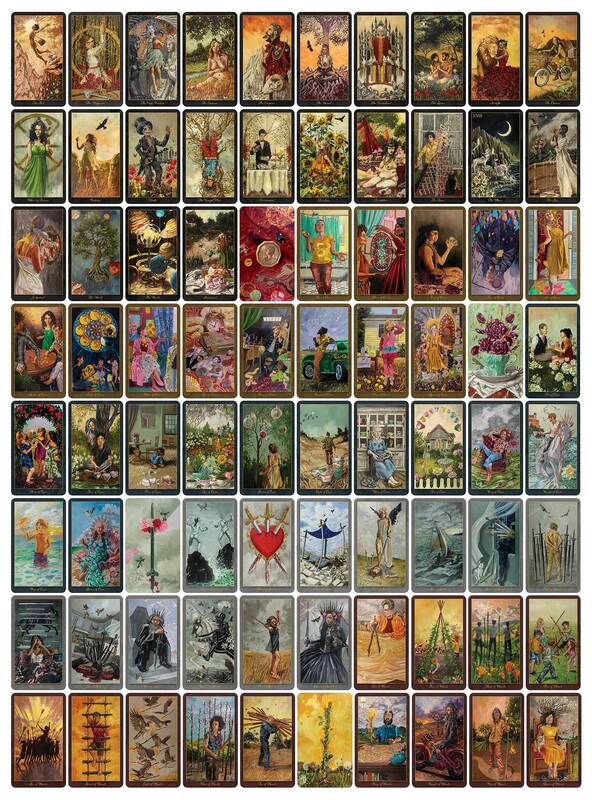 Every three months or so, I like to take stock of my tarot collection, take all of my decks out, and ask each of them individually how it is feeling about our relationship. I generally keep my collection at around 20 decks, as I find when I have more than that, there are some decks that never get used. It’s been about three months, and here’s my current collection. I currently have 24 decks, which is the most I’ve ever had at any one time. Here are my decks in their tuck boxes, boxes, or tarot bags. I also did shuffle each and every deck and asked each one how it was feeling about our relationship. Let’s just say that some decks, which I have shown more love and attention than others in the last few months, have expressed that love back, and some, which I have neglected these last few months, are reminding me of that fact.